There’s no greater theme for a party than Alice in Wonderland. It’s definitely a license to go a little crazy and be extravagant. 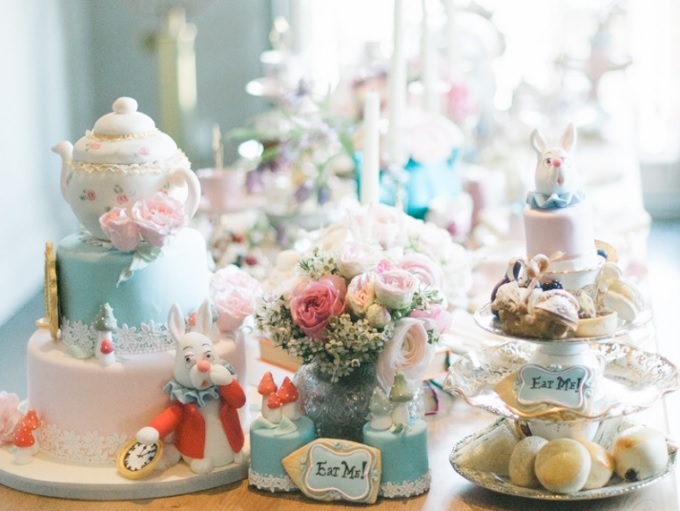 Whether for grown-ups or kids, a Mad Hatter’s Tea Party for any occasion will definitely make your celebration much, much more than a run-of-the mill get together. As well as a magnificent cake, a truly spectacular dessert table is a must if you really want to take on the Alice in Wonderland theme. At cakes by Robin we take eccentricity seriously. No tea party is too big (or too small) for our professional and artistic team. We love the challenge of coming up with quirky ideas in cake form and with an Alice in Wonderland theme we have the perfect platform for creating an enchanting display. Whether your favourite character is the Queen of Hearts, the Mad Hatter, the March Hare, the Doormouse, the Cheshire Cat or Alice herself, we can make this classic and colourful story come alive on one of our extraordinary cakes. You might like to go crazy with the cake flavours and fillings too. Our rainbow cake looks simply fabulous. Or our red velvet American classic in an eye-catching red colour means there’s a gasp when you cut the cake, as well as when you parade it out. Even if you choose to play it safe on the inside with a classic Victoria sponge, your guests will still be wowed with the amazing cake decorations displaying the crazy and kooky world of Alice in Wonderland. For a whole table of treats to make any guest grin like a Cheshire cat, we can make your tea party an extravagant delight. With handcrafted cupcakes, intricately decorated cookies, unusual cake pops, and colourful macaroons, your tea party table will be a feast for the eyes. Even the Maddest of Hatters will be lost for words. Let Cakes by Robin do all the hard work. It’ll give you more time for dressing up and a game of croquet. The table was a large one, but the three were all crowded together at one corner of it: `No room! No room!’ they cried out when they saw Alice coming. `There’s PLENTY of room!’ said Alice indignantly, and she sat down in a large arm-chair at one end of the table.” – Lewis Carroll, Alice in Wonderland. Just in time for the maddest tea party of all.